Chain conveyors have come to the rescue for many of our clients over the years. Their versatility and ability to stand the test of time make them a particularly strong asset to invest in. Whether it be twin strand simplex chain drives, or triple strand duplex or even triplex chain drives, Andrews Automation Ltd have the knowledge and experience to tailor a solution to suit client requirements. Chain conveyors are an ideal solution for loads with non-uniform undersides, i.e. not flat bottomed. 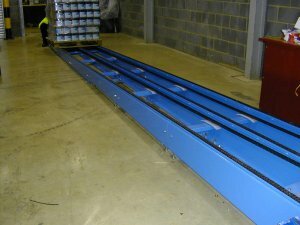 Chain conveyors are also a wise option when considering the movement of Euro pallets. 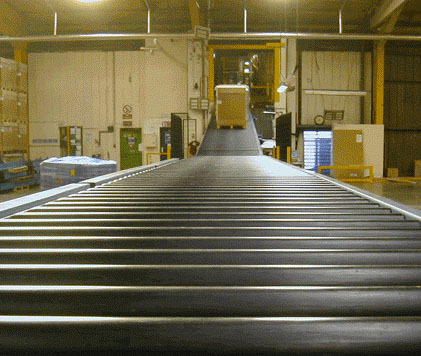 As they utilise the three bottom runners as the travel surface, Euro pallets can only travel down roller conveyors in one orientation. This becomes problematic when a change of direction is required. Chain conveyors negate the need to invest in turntables to change pallet direction, which can be relatively costly and eat into facility footprint. Chain conveyors are also relatively simple to maintain. With them made up of mainly standard of the shelf components such as sprockets, chains, bearings and motor gearboxes, they are an asset that can, on the whole, be maintained by the clients own in-house maintenance team. This also removes the need to hold special, costly items with long lead times on the shelf. 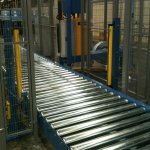 Chain conveyors from Andrews Automation Ltd are built with quality in mind and are built to last. Our conveyors are shipped globally so need to stand the test of time. Our systems are built using quality components and all systems are supplied with a 2 year warranty. 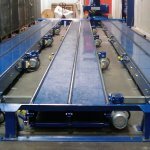 Our chain conveyors are designed, built and tested in-house at our facilty in Goole, including all mechanical and electrical work. For more information or to discuss your requirements, please call our office on 01405 768900 and speak to Darren.